Many people look forward to winter and all its associated pleasures: ice skating, building a snowman with the kids, and plenty of holiday cheer. But as people age, winter may become less cheery and more dangerous. Ohio winters bring snowstorms, brutal drops in temperature, and icy roads and sidewalks. All of these conditions present serious safety hazards to your loved one. Shorter Days. Fewer hours of sunlight can contribute to depression in seniors, especially those who who are less mobile. Cold Temperatures. 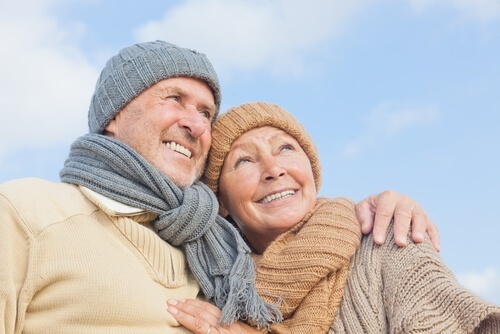 As people age, they often experience poor circulation which makes it harder to get warm and stay warm. The cold temperatures of winter may contribute to hypothermia, especially for seniors who have medical conditions like diabetes. It can also increase the risk of cardiovascular events. Snow and Ice. Snow and ice create hazardous conditions around the home, making it difficult or risky to perform routine tasks like walking to the mailbox, taking out the trash, or caring for pets. Power Outages. When winter storms cause power outages, the elderly face increased risks of injury due to loss of heat, falls at night, or failure of life-sustaining equipment. Isolation. Winter may make travel more difficult, contributing to increased isolation when seniors can’t go shopping, or spend time with friends and family. Nutritional Deficiencies. Fruits and vegetables aren’t as readily available in the winter. Your loved one may have a harder time maintaining the nutritional variety needed to stay healthy. The good news is that caregivers can help your loved one avoid winter’s pitfalls. Follow these senior safety tips to keep your family member healthy and safe all season long. Dress Warmly. When winter clothes and blankets have been packed away, seniors may find it difficult to dress appropriately for the weather. Caregivers can help by making sure your loved one has warm clothes and plenty of blankets on hand. They can also provide assistance with dressing to protect against temperature drops. Avoid Falls. Snow and icy conditions increase fall risk and can result in fractured wrists or hips. Caregivers can assist with walking to and from the car, checking the mail, or keeping melted snow from creating a hazard inside the house. Get Out of the House. One way to prevent seasonal depression is to get out in the sunshine and maintain social connections. When possible, caregivers can provide transportation to and from the grocery store, religious activities, or doctor’s appointments. Of course, it’s critical to restrict traveling when roads are dangerous. In these cases, caregivers can provide companionship at home for your loved one to prevent feelings of isolation. Eat a Varied Diet. Even when the grocery shelves aren’t as fully stocked as usual, caregivers can ensure that your family member eats a healthy, varied diet high in vitamin C, D and other important nutrients. This may help prevent seasonal illnesses like the flu by supporting the immune system. Prepare for Power Loss The most significant danger of a power outage is loss of heat resulting in hypothermia. But loss of power can also increase the risk of falling at night when the lights are out. Prepare for power losses by creating a plan that includes home modifications if necessary and an alternative source of heat and lighting. Caregivers can help by making sure your loved one has flashlights and plenty of food and water on hand. They can also check in on your family member to make sure he or she is safe. 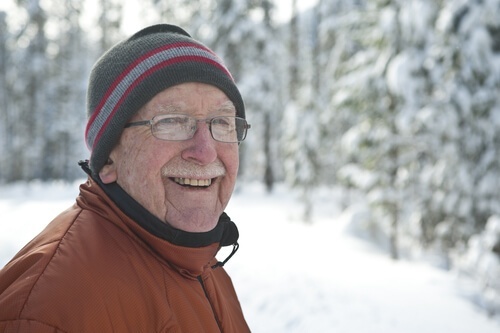 Caregivers provide the assistance your senior loved one needs to protect against the safety risks of winter. If you want to know more about working with an at-home caregiver in Ohio, download our free Guide to Home Care.